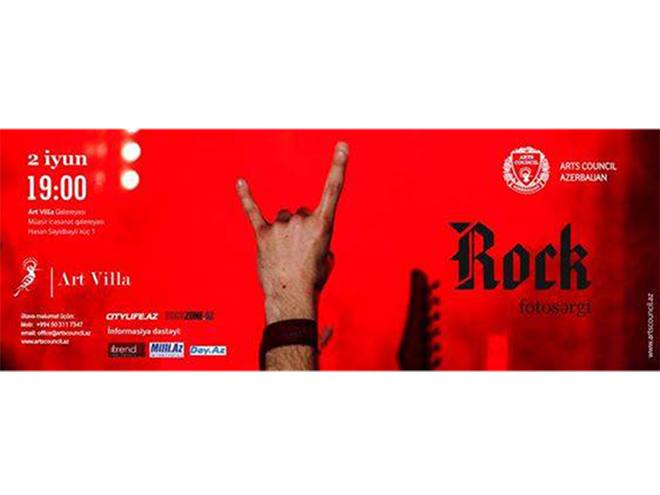 Baku`s Art Villa gallery will host a photo exhibition "Rock!" on June 2, Trend Life reports. "Rock!" is a joint project of famous photographers Rustam Guseynov and Tofig Rashidov devoted to Azerbaijani rock music, a unique musical and social phenomenon that played a major role in the formation of the modern musical and social culture. The exhibition will feature photos of members of the rock community, musicians who played a huge role in the rock life of the country. The event is expected to begin at 19:00. The entrance is free. Media partners of the event are Trend, Day.az , and Milli.az. National rock music formed in 1960s. Leading bands of this period were namely "Eskulap"(1966), "Khurramids"(1969), "Express-118", "Pazavang", "Uvet", "Brevis" (1971) and "Three Flames", which were mainly playing soft rock and blues. The later 1970s were largely silent and few bands survived political restrictions. The early 1980s saw soft rock band "Gunel" and Polad Bulbuloglu's emergence as " Ashiqlar"vocalist. "Talisman" which was a part of well-known Azerbaijani vocal quartet "Gaya" gained popularity among rock music lovers. In 1985, the band played live at 12th World Festival of Youth and Students in Moscow. Later 80s saw emergence of many bands led to establishment of Baku Youth Modern Music Center. "Rock Panorama 2" festival was held in 1989, which was larger than its predecessor. The spiritual strength and incredible energy of rock music led to the emergency of the festival "Rock Panorama" in 1988. After the collapse of the Soviet Union, the rock audience started slowly to grow in Azerbaijan. Sumgayit city was considered the main regional driving force behind the rock bands of the 1990s. Azerbaijani rock scene gained momentum after 2010. New genres including heavy metal, metalcore and black metal received positve responses. The bands "Silence Lies Fear", "Meridian", "Sirat", "Tengri", "Vozmezdie", "The Midnight", "Orient Express" gained tremendous popularity. Today, Azerbaijani rock lovers can freely dive and enjoy the atmosphere of real live rock concerts held at various clubs.